For too long the iron legions of the evil empress of Hamal have devastated the neighboring lands and islands of Kregen. Under the twin suns of Antares, that planet of marvels had been made a scene of carnage, rapine, and death. Dray Prescot, Earthman transported to Kregen, had battled Empress Thyliss all the way, and at long last found himself nearing the showdown of his long campaign for his new homeland. Gathering about himself old allies and former enemies, Dray prepares to challenge the empress at the very doors of her capital city, until he discovers that she is about to spring her secret weapon: the super-science of the mad wizard of Loh. 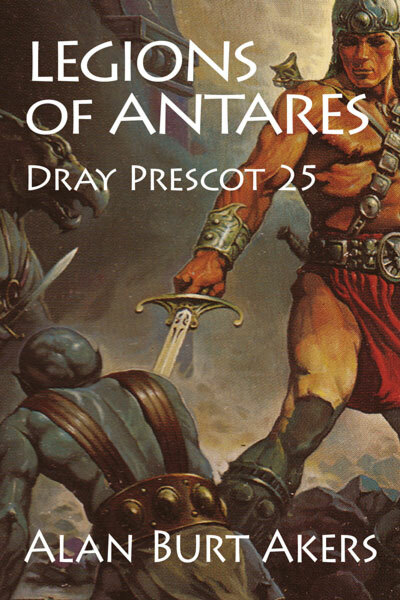 Legions of Antares is the twenty-fifth book in the epic fifty-two book saga of Dray Prescot of Earth and of Kregen by Kenneth Bulmer, writing as Alan Burt Akers. The series continues with Allies of Antares.